Come to the Block Party Fundraiser – June 19th! Come to 22nd and Bartlett Street, June 19th 11-3pm. Come for live music, dancing, capoeira, community booths, games, raffle prizes and delicious food! To make the Mission Community Market a reality we must raise funds! 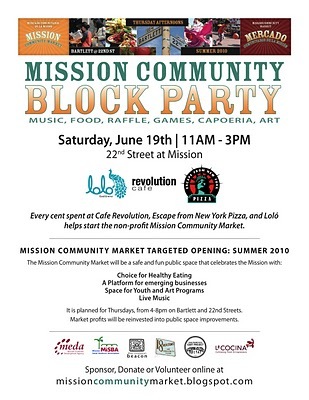 Profits from all food bought at Loló, Cafe Revolution and Escape from New York Pizza will be donated to the Mission Community Market for start-up costs and permits. Help create a public space in your Mission. 3 Responses to Come to the Block Party Fundraiser – June 19th! My name is Aman Grewal. I am contacting you on behalf of Joaquin Torres of the Mayor's Office of Neighborhood Services. Joaquin serves as Mayor Newsom's liason to District 9 and our office would be thrilled to assist in outreach for the upcoming Block Party fundraiser. Please feel free to contact Joaquin at 510-554-5975.